Basically you have two choices when it comes to windows and every building usually has both kinds. Fixed windows are windows that do not open. They are generally more efficient because they can be more airtight and they offer the most in terms of safety and security. Operable windows are windows that open. They c0an provide a means of escape in emergencies and fresh air ventilation when desired. Casement windows swing outward on hinges. They are opened and shut by means of a roto-gear and crank located at the bottom of the frame. When closed, locking mechanisms on the frame pull the sash up against the frame and lock it tightly in position. Awning windows swing outward at the bottom. The most common practise is to have them swing outward and the window is usually operated with either a roto-gear and crank or a simpler push-out lever. The hardware does not allow these windows to open all the way. Hopper windows are the reverse of an awning window in that they are hinged and open inward at the top. Tilt and Turn windows first appeared in Europe but are now available in North America. They feature special hardware that allows the window to either tilt inward like a hopper window, or to swing inward like a door. 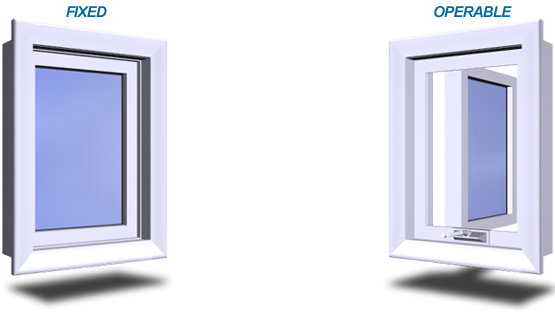 Vertical Sliders have two glazed units in separate sash, one above the other in the frame. In a single hung, the bottom sash slides up to open and down to close. In a double hung, both the top and bottom sash can slide up and down to be opened or closed. A balancing mechanism prevents the sash from falling when raised. Horizontal Sliders have two glazed units in separate sash mounted side by side in the frame. The sash slide horizontally and as with the Vertical Sliders, they can also be single or double. Most designs have at least one removable sash.